ECAS is a browser-based educational software that runs on a server and can be accessed from various terminals on their web browsers. Such a versatile system is mandatory to coordinate among different departments in an institute. Especially when it comes to inventory management operations like checking stock availability, items purchase, updating stocks, segregating equipments into groups, etc. These stock items could be lab equipments, stationery items, chemicals, specimens, etc. All such diverse group of items needs to be organized and allocated to their respective departments. All these operations come under inventory management and ECAS precisely and accurately handles such detailed tasks through its user-friendly interface. There is a stock entry panel called Inventory Stock Group where you can categorize equipments and items with their group name, group id, item category, stock type, etc. Once updated, you can see the each item details under the selected stock group. This is very useful for allocating chemicals under lab chemicals, amplifiers in electrical, oscilloscope in lab equipments, etc. 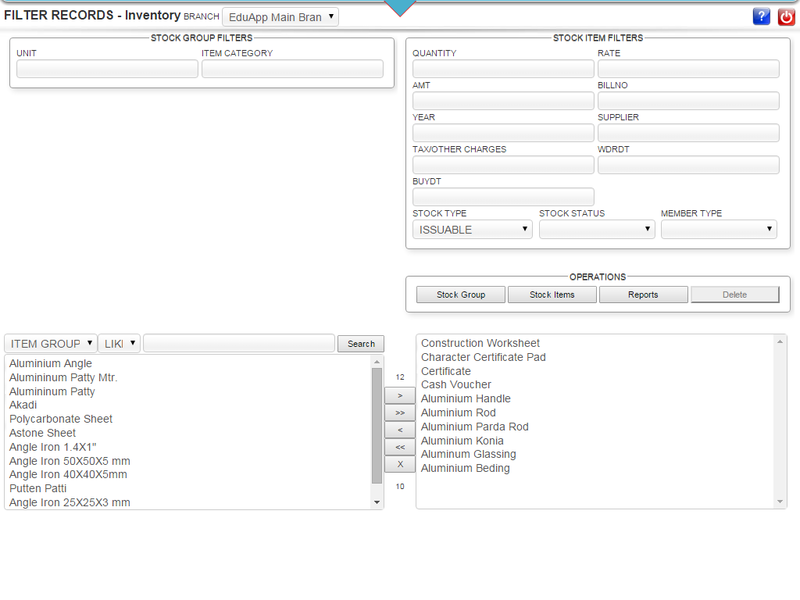 Once you select a stock item, all its details are displayed in the in the Inventory Item panel like branch, group id & no, stock type & status, date, quantity, rate, amount, bill no & date, supplier name & address, etc. You get a detailed summary list of the inventory items in this panel where you can update them if required. You have lot of options for elaborate filtering and searching of inventory items the Stock Search panel. 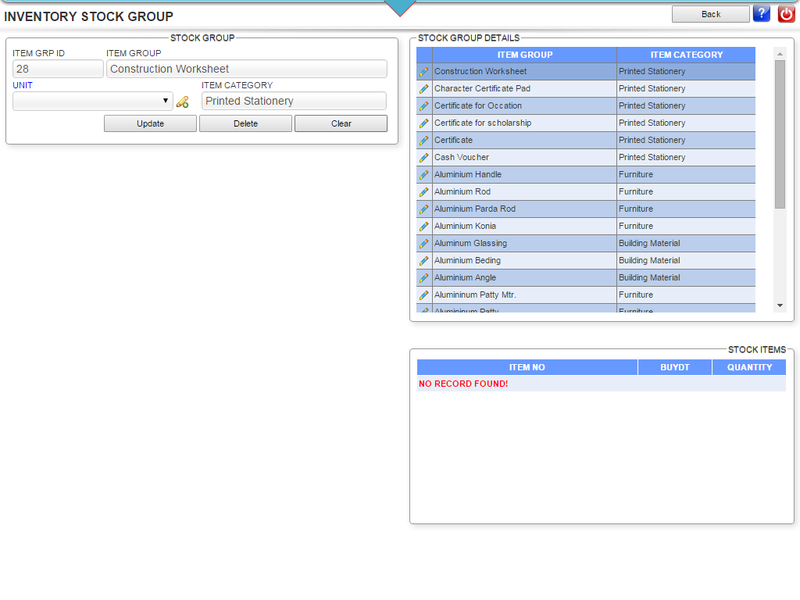 You can retrieve the list of items that you are looking for using stock group filters and stock item filters. From the displayed list of items, you can select and unselect items to be stocked in the inventory. Once the list of items to be stocked is gathered in the window, you can stock them by clicking on stock group or stock item under operations. The reports of all such operations are documented in the database. 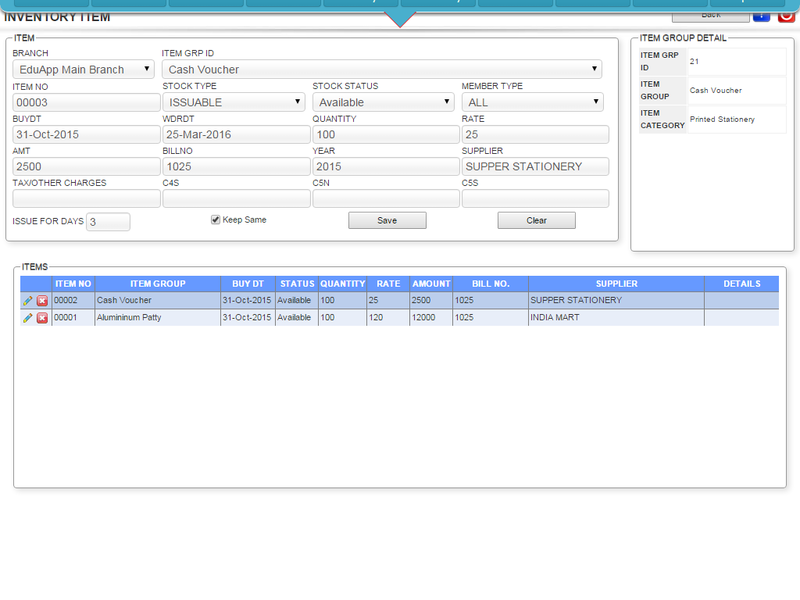 These reports can be drawn easily with reports filters like type of reports, status, branch, stock type, etc. Transactions like issued items, opening/closing balance, overdue items, returned/lost/damaged items, etc. can also be viewed from this panel between any dates. The software retrieves these reports from a huge collection of database, exports it in Excel and PDF and makes it available for printing. Only officials with user permissions have control over the item indents and issue. This is how the inventory management of schools, colleges and universities can be controlled and coordinated efficiently with the help of such a client-customized university management software.